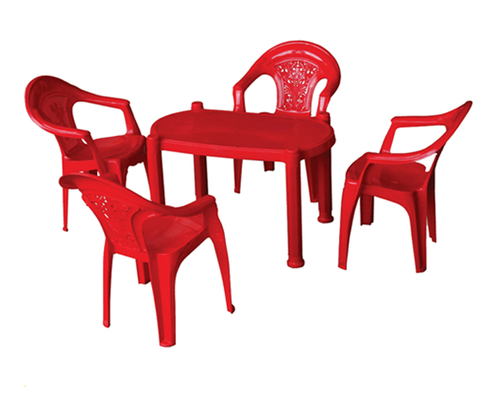 Available under Swagath brand, Baby Chair with Baby Table is available in a wide array of colors and designs and come made from the finest polypropylene, using computer designed moulds. Being tough and lightweight in the finish, its good quality and modern designs make them preferred the choice of customers. Further, these are also weatherproof and virtually maintenance free. Available in a wide range of attractive color choices, the available models can be used for both indoor and outdoor areas. Uma Plastics Ltd. has emerged as a leader in the plastic injection moulding industry with their brand name 'SWAGATH' for molded plastic furniture. We been awarded with ISO 9001:2008 & ISO 14001:2004 certification from British Standard Institute (BSI) for Quality Management System and Environmental Management System. It is equipped with in house R&D facility to design and develop new products in its State of the Art Designing Center, tool room and testing laboratory. Uma Plastics Ltd. has set a benchmark for competitors on the lines of quality and elegance by manufacturing premium quality products to give clients excellent services and true value for money.